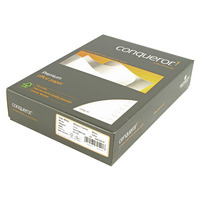 Conqueror CX22 Paper Diamond A4 White 100gsm Ream (Pack of 500) CQX0324DWNW Pack of 1 Conqueror CX22 Paper. Premium watermarked, paper with a smooth, satin ultra smooth finish guaranteed for use on desktop, inkjet and laser printers. Weight - 100gsm. Size - A4. Colour - Diamond White. 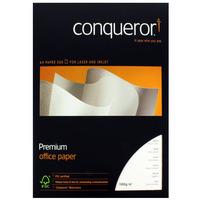 Conqueror Paper Wove Brilliant A4 White 100gsm Ream (Pack of 500) CQW0324BWNW Pack of 1 Conqueror Smooth Wove Paper. The crisp surface which is both contemporary and versatile gives a professional impression on all your correspondence. 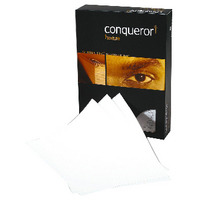 Suitable for use in both colour and mono laser and inkjet printers. Size A4-100gsm. Brilliant White. 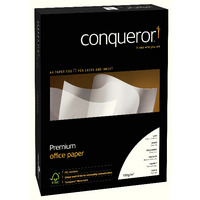 Conqueror Paper High White Wove A4 100gsm Ream (Pack of 500) CQW0324HWNW Pack of 1 Conqueror Smooth Wove Paper. The crisp surface which is both contemporary and versatile gives a professional impression on all your correspondence. Suitable for use in both colour and mono laser and inkjet printers. Size A4-100gsm. High White.